Stampin' Up! Paper Pumpkin - Subscribe Today! This is a great way to have a Girls Night Out! If you are interested in scheduling one, please let me know. Stampin' Up! Weekly Deal Tuesday! Here are this week's deals. These items are available until Monday, December 7th. 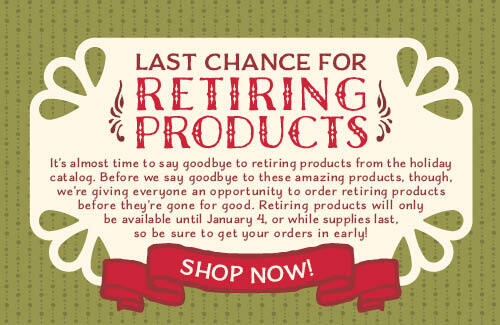 Also, please remember to check out the list of our Holiday Retiring Products here. Once these items are gone - they're gone. To order 24/7 visit my website here. 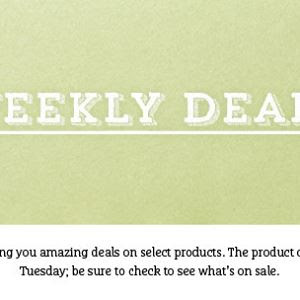 Weekly Deal Tuesday plus Online Extravaganza! Check out today's weekly deals below. Two great stamp sets and awesome paper options this week! Perfect to get a head start on your holiday creations. Don't forget about the online extravaganza. You can find the list in yesterday's post...items up to 50% off while supplies last. There will be two 24 hour flash sales plus products on sale up to 50% off. Please check out the list here. Don't miss out on these awesome deals - order now! Today, I wanted to share the cutest card ever and a quick video. I made this card last Friday night at my friend Jeanne's stamp night. This idea blossomed from a video I saw Connie Stewart doing on a spinning snowflake card. Click on her name to watch that video too! 6. Stamp penguin in black onto a scratch piece of Whisper White, color in beak and feet with Tangelo marker. Then cut your penguin out using your framelit. d. Now place brad through the middle of circle and real red. Do not tighten brad too much or penguin won’t spin. 9. Wrap twine gently around penguin and pull gently. Note: Just be patient sometimes the sticky dimensionals or adhesive you used on penguin get him stuck a bit. The more you play with it the better it gets. I also found that it brad is too tight on back of real red you may need to loosen it a bit. Stampin' Up! Holiday Catalog Retiring List & Weekly Deals! It's about time to say goodbye to retiring products from the Holiday Catalog. 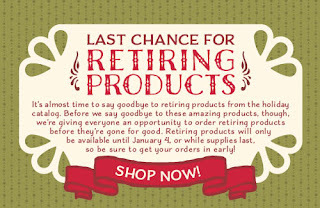 Retiring products will only be available until January 4, 2016, or while supplies last. Click here to see the list in a PDF version. Some of my favorites are on this list so grab while you can! Also, it's Tuesday - so Weekly Deal Time! Wonderful items this week - Season of Cheer Cardstock and Snow Friends Framelits!!!! Can you tell I'm excited? I worked with the snow friends framelits this past weekend and coordinating stamp set..fun, fun, fun. I will share that card with you all tomorrow. Happy Day!!! I'm so excited to share this project with you! I know I will be doing a lot of these over the holiday season. Why? Because who doesn't love gift cards! Shopping for others is not my forte but listening and knowing what they love is! Which means I know exactly where to get them a gift card or certificate where they can pick out whatever they love. Hmmm, which means I should probably leave a hint here for my kiddos and hubby..stamp n storage gift card please ;) I digress. Pool Party - I think I may be addicted. :) I am loving this color with everything lately. This pillow box can be used all year long - it is so versatile. So, to show you how versatile it can be - check out my 2 pillow boxes below. Totally different colors but both look great and actually this box would work in any color. What time is it? Weekly Deal Time! This week's deals are not to be missed! 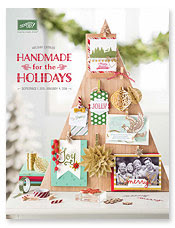 They are all festive so you will be ready to create your own holiday projects. Hello! Today I have a winter card to share and a video. Now some of you may say, this card looks familiar...well that's because I shared a picture of this same card earlier in the month but in a different color. This time I used Pool Party versus Elegant Eggplant the first time. I actually can't decide which one I like best :) What do you think? Here is a list of the products I used in this project. If you enjoyed this video, please subscribe to my blog or leave me a comment. It's that time again - weekly deals start today November 3rd and run until November 9th. Happy Monday! Today, I have a video for you. Yay! I know it took me a while but my camera was giving me trouble. I finally ordered a new battery so hopefully that will do the trick. Today's project features Stampin' Up! Sheltering Tree stamp set. This is by far one of my favorite sets. It is so versatile and can be used with many color combinations. Not to mention I love the font on the sentiments. I hope you enjoy the video and the project. This is only my 2nd video ever so I'm still learning but I will share another Winter Video later this week. Don't forget to check out the weekly deals tomorrow. Happy Tuesday!! Just wanted to share the new weekly deals with you. I just love the ribbon this week and the washi tape. One of my favorite Stampin Up! colors is Melon Mambo and they have the cotton ribbon and satin stitched ribbon this week. Yay! Happy Shopping!! As promised, here's the July Paper Pumpkin kit. What can I say - another very cute kit! I LOVE LOVE LOVE these kits. I have been a subscriber for two months and definitely plan to continue. I love how they package the kits and how everything you need is included so you can just sit down and get started! It could NOT get any easier than that :) I was able to create 8 cards from this kit. Check out my pics below. Cute aren't they! To order your kit click here and save 50% off your 1st two months!!!! Half Off Paper Pumpkin AGAIN!!!! Stampin' Up! just announced that they are doing ANOTHER 50% off your first two months of Paper Pumpkin AGAIN! They normally don't have such awesome specials so close together but wanted to do something for Convention Kick Off! This special is for first time Paper Pumpkin subscribers only. I absolutely LOVE my Paper Pumpkin monthly subscription!! Click on the button to sign up now for 50% off your first two months! Happy Weekly Deals: July 21st - 27th! P.S. I finally got the July Paper Pumpkin kit and look forward to sharing it with you soon. I have company in town this week so I'm not sure if I will get any crafty time in. Don't forget to check out the Clearance Rack too! Happy Thursday!! I attended a stamp night last Friday, a friend of mine hosted and wanted to share the 3 cards we created. Since I'm a newbie to Stampin' Up! this was a great experience for me. I was able to see how she hosted and organized the event but also learned a new technique - watercoloring! Double bonus for me :) I can't wait to watercolor some more when my aqua painters come in. 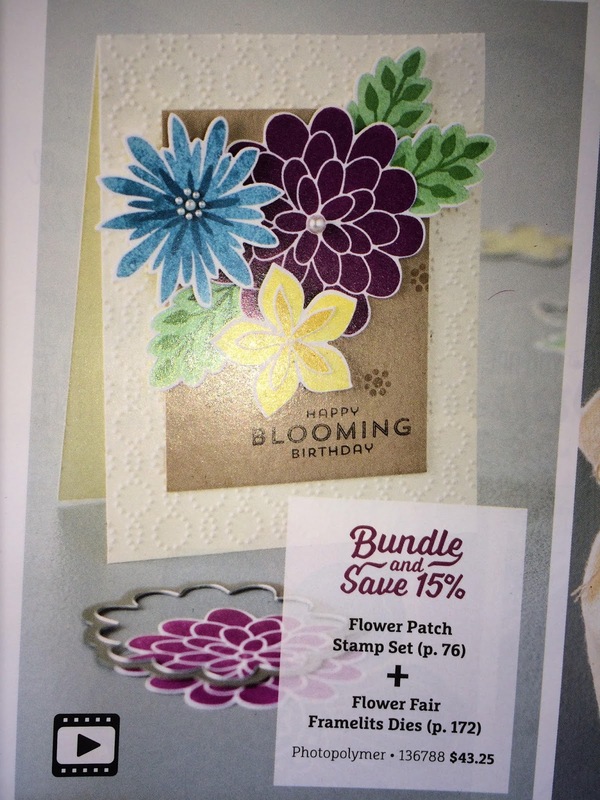 Each card was made with current products available in the catalog. I have shared some of the supplies used below. I hope these inspire you to get creative! Don't you love the baker's twine, washi tape and embossing folders?! So cute! Last Day to Order the July Paper Pumpkin Kit! Today is the last day to order the July Paper Pumpkin Kit from ©Stampin' Up!. I have been a member for 1 month and am super excited to see what the July kit will be! When I signed up as a demonstrator, I was surprised with a paper pumpkin kit in my starter kit. What's so great about these kits are they arrive with everything you need to complete the project - stamps, ink, paper, embellishments and any pre-cut designs you may need. How easy is that?! The best part....it's a surprise in your mailbox each month. To order your kit visit: Paper Pumpkin You can either order month by month or order for the year...also you can cancel anytime with no penalty. As promised I wanted to share my first card made with Stampin' Up! products. I joined Stampin' Up! as a demonstrator under Robyn C (aka MyPinkStamper.com). We have a huge group of new demonstrators who have joined Robyn's team so she suggested we do a card swap. Such a great idea, right!! Especially for us newbies who have to build up their product stock and learn new techniques. I can't wait to see what everyone created. I'm sure all of the cards I receive back will be awesome. Seeing everyone's work will be so inspiring! Here's what I came up with from my starter kit. Start your adventure for just $99 and receive $125 worth of products you choose from the current catalog. 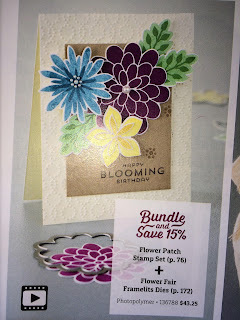 Visit my website http://theirishscrapper.stampinup.net and click on Join the Fun! Check out the new weekly deals! This deals are available starting today, July 7th through Monday, July 13th. Some really cute items. It's so easy to get started. Simply sign up for the program by visiting PaperPumpkin.com and click Get it. Every month a new, surprise project kit arrives at your doorstep. Just think of the anticipation of creating a fun project to pin, showoff, and share with your friends and family every month!